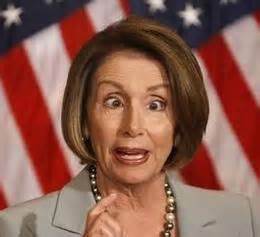 The "DEVOUT CATHOLIC" Nancy Pelosi said yesterday that she believes Pope Francis wants Republicans to shut up and fund Planned Parenthood. Now, I know that Pope Francis has said some confusing things over the past year but he's been pretty clear about the sacredness of life, hasn't he? But Nancy Pelosi has a long well documented history of what can only be intentional abuse of Church teachings. As you know, Republicans are seeking to defund Planned Parenthood. In pushing for Big Abortion to receive all the taxpayer money they can fit in their bloody hands, Pelosi, according to CNS News, said, “It doesn’t have to be this way. Instead we could be working together recognizing a Republican Congress, a Democratic president, the ability for Democrats to use their leverage legislatively to have compromise for the good of the American people. That’s what Pope Francis told us to do...He said leaders should have transparency. That would be wonderful - openness, he said. He used the word openness and pragmatism, and he said we have to move forward for the good of the people...Let’s in the spirit of Francis do that." So, she's saying that Pope Francis wants the Republicans to shut up and fund Planned Parenthood. Interesting that what the pope says only counts when it can be twisted to say what she wants. I thought all efforts to bring Catholicism into politics was theocracy. Separation of state and all that, right?